FUN FACT! I used to be a Wedding Planner. The 8 years leading up to getting married and starting a family, I was planning some very extravagant and gorgeous Weddings in Vancouver. Being on-call 24 hours a day 7 days a week to my Brides, although very exhilertaing, it was also very draining. I knew once I was ready to settle down and start a family this career would be over for me. 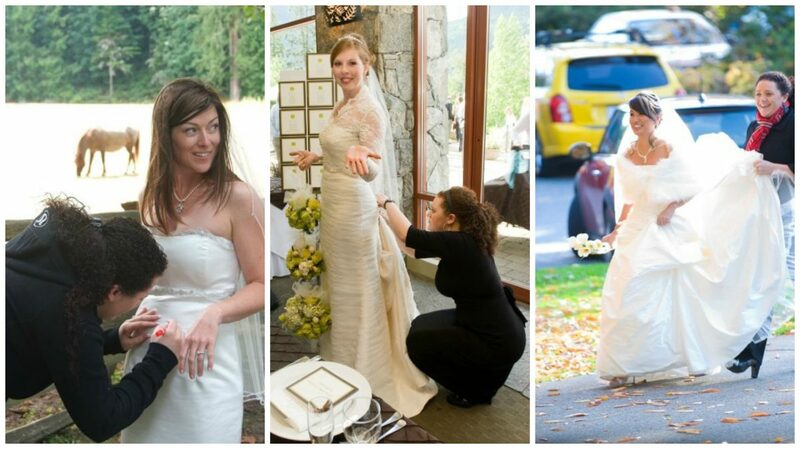 So while it lasted I lived for every last detail, every bride-zilla, every tear worthy speech. It was AMAZING! Over the years I learnt a fair bit about Wedding Day Emergencies and just what one needs as a Bride, Groom and Guest at a Wedding. When you have 1-day to get it right, there is no room for error. It’s why they hired me, it was inevitable something would go wrong. I was there to ensure the Bride and Groom knew nothing about these mishaps and that the day was nothing short of spectacular. With Wedding Season now in full swing, I thought to share my Wedding Day Emergency Kit Essentials for not just the Bride, but Bridesmaids and Guests. You can never be too prepared. But should something go wrong, just look for the Wedding Planner. She will have the answer! I cannot begin to tell you guys just how often I used a stain remover when I was a Wedding Planner. Let’s just put it this way, I used it MORE than I do now as a mom. THAT says a lot! It doesn’t matter if you’re a guest or the main attraction (the Blushing Bride) you both should have a stain remover with you at all times. If not for yourself then for the person that JUST spilt red wine on the front of their shirt. You will be forever remember as the one who saved their day. And those people always go down in history. There is one in your car, one in your house, and if you’re me one in your purse with you at all times (accidents happen). A mini first-aid kit is very important to any and every guest at a Wedding, including both the Bride and Groom. The day is long, the food is rich and the drinks go down way too smooth. Keeping a first-aid kit close at hand is never a bad idea. At every single wedding I planned, I had at least 1 person come to me mid-night asking for Aspirin Extra Strength. Do yourself a favor and bring one. No, you’re not the hulk, the tears will flow. Bring the tissues, you’re going to need them. Another Wedding Day Emergency Kit Essential is Tissues. Lots and lots of soft tissues. And also, If I may, use more of a blotting technique to your under-eye wipe versus the traditional aggressive rub. I seen far too many raccooon eyes after a Ceremony not to say something. Oh! and another handy tip, take the tissues OUT of the loud crinkly wrapper before you get the angelic quiet Ceremony. Yah! you’re welcome! By the time it was my turn to walk down the aisle, I had learnt my lesson. If I wasn’t going to breathe for the sake of my gorgeous mermaid dress, I would at least ensure my feet weren’t sore. I wore flats. I do however know this isn’t usually the first choice of most, Brides or Guests, and this is why a good insole is a must. Throwing your shoes off at the end of the night is pretty much a guarentee. But why suffer up until this point, get a good high heel insole and call it a day. Do not leave home without one, because I promise you, the Wedding Planner will not be able to save the day on this one. I speak from expereince. If you’re going to attend a outdoor Summer Wedding, that goes anything past 6pm, be the hero. That guest who not only looked absolutly stunning, but the one who brought magic in a can when the moisquitos came out to play. Nobody likes to fight off mosquitos, especially not when they could be dancing the night away with an open bar just steps away and a midnight buffet calling your name. noone. Pack the Muskol Insect Repellant and save the day for everyone (and your body). The final Wedding Day Emergency Kit Essential has to be a sewing kit. One that consists of a very small needle and thread set and a few safety pins. Another item I used almost too much at Weddings were safety pins. Whether it be pinning the brides broken bustle or securing Aunt Rachels wrap dress that just refuses to stay “wrapped-up”. A safety pin was always the answer. Should you get stuck without, or have an Aunt Rachel at your Wedding that used the last pin. Ask the Wedding Planner, she will 110% have many to spare. If you have a Wedding to attend this Summer do not leave home without this little DIY Wedding Day Emergency Kit. I promise you, if you don’t use anything from it, you’ll save someone elses night with it. I agree with these items in the emergency kit! I especially agree with the stain remover (many accidents can happen at weddings, I can imagine) and insoles, especially for the bride. I often hear of brides having to wear high heals for hours, which can create achy and blistery feet in the end! I would not have thought of stain removers. Great list. I would remember this list if I attend a wedding. I imagine being a wedding planner would be fun and beautiful, but also stressful! These are great tips, especially the sewing kit. The button that held my zipper up broke at my reception and we almost had a major wardrobe malfunction. Luckily, my mom and I are both avid sewers and had that kit on hand! im getting married in october and i was totally putting together a day of kit for my bridesmaids to have! these are great suggestions! 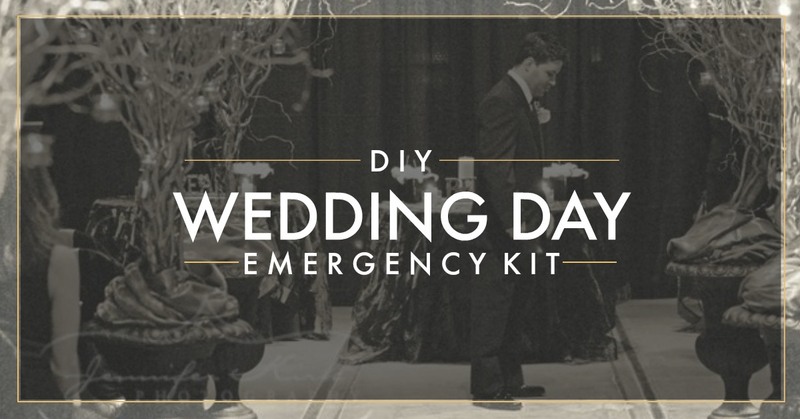 I love the idea of a wedding day emergency kit! These items are awesome and would certainly help any bride on her wedding day. Thanks for sharing!